Trump wants to pare down the current seven individual tax brackets, which currently are in tiers ranging from 10 percent to 39.6 percent. President Donald Trump outlined his plan for federal tax reform Wednesday. His administration worked with with congressional leaders on the proposal, which calls for cutting taxes for businesses and the middle class. Trump told a crowd in Indiana, "Democrats and Republicans should come together finally to deliver this giant win for the American people." Trump says he wants to keep the U.S. competitive, so his framework suggests reducing the corporate tax rate from 35 percent to 20 percent. He also called for a new 25 percent tax rate for so-called pass-through businesses. According to The Brookings Institution, the income from those businesses "passes through" to the owner and is then taxed under the individual tax code. About 95 percent of businesses in the U.S. fall under this category. 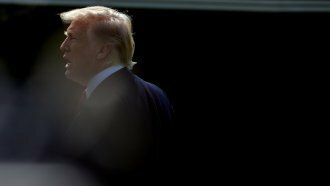 As for individuals, Trump wants to pare down the current seven tax brackets, which currently are in tiers ranging from 10 percent to 39.6 percent. The president's framework calls for as few as three brackets at 12, 25 and 35 percent. A unspecified fourth bracket could be added for the country's wealthiest people. Trump's plan would also increase the child tax credit, something his daughter and White House adviser Ivanka Trump has pushed for. None of this is set in stone yet. Trump's plan is just a framework for lawmakers who will draft a tax reform bill.